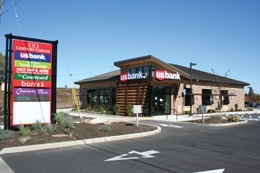 A new flagship US Bank location on Bend’s westside is being welcomed on Century Drive, serving as an iconic landmark in front of the evolving Century Center mixed use development. The latest addition to the burgeoning financial landscape – which officially opens October 18 – is a slight departure from the prototypical US Bank look, with natural materials much in evidence as well as sensitivity to environmental concerns and sustainable practices. In fact, the 3,000 square foot building is working towards achieving Leadership in Energy and Environmental Design (LEED) certification. Project Manager Dave Watson of Kirby Nagelhout Construction Company, said the branch, incorporating offices, teller stations and both a drive-through and “vacuum-assisted” teller, also features recycled source materials, including those derived from sustainable forests sanctioned by the Forest Stewardship Council. Green-conscious and energy efficient features also include ‘daylight harvesting’ with sensors regulating use of powered, versus natural, light; low Volatile Organic Compound (VOC) emitting materials, recycled flooring products, a ‘cool’ roof with high insulative qualities, and solar generating capabilities. US Bank Regional President Stacey Dodson said the construction project on SW Century was the culmination of a seven-year search for the right site for a new branch on Bend’s west side. She noted: “During the boom period a few years ago, we must have looked at over 50 properties, but we took the time to get it right. “We were looking for something that offered the optimal location regarding convenience and access with a presence near to a high concentration of west side homes. “We are also excited to be part of a vibrant business community developing along Century Drive which has evolved as a major thoroughfare on that part of town and is the gateway to so many of the recreational opportunities in Central Oregon that we all enjoy so much. “This location and the staffing are a recipe for success. It will be a full service branch with a great team on the ground. “Customers demand convenience and that means we have incorporated everything from weekend hours to drive-up ATM’s and tellers, as well as easy, late access and ample parking. “When we looked at potential spaces previously, we couldn’t find the right mix, for example, of a pad large enough to accommodate all the drive-through capabilities desired until this opportunity came to light. “In a time when we hear so much about high unemployment it was also gratifying to be able to create a number of living wage jobs, both in terms of the construction process and eventual branch staffing. Project Architect Neal Huston, Principal of Neal Huston & Associates, said among the project challenges were optimizing access, signage and visibility. The site plan also needed creativity to accommodate the through access from Century Drive to the balance of the Century Center development to the east. He added: “Drive-thru accommodations are often a challenge; they need to work with internal site vehicular traffic circulation, the functional layout of the interior of the bank; and the City of Bend prefers they not face the street. “Also, though the parking areas are to the south and east and the entry is on the south southwest corner of the building, a clearly prominent and highly visible entry feature needed to be developed to create an orientation to Century Drive to the west. “Other important factors were that the material and color palette needed to reflect the natural characters of the Central Oregon environment. Dodson added: “We are also sensitive to environmental concerns and are proud that the construction will be achieving LEED certification, as well as the fact that we utilized local talent for the project. “As a full service branch, it will feature a full line of products and services, both in the business and consumer banking sectors. There will also be access to a small business expert – which is particularly fitting as we are in the midst of a westside commercial hub – as well as wealth management and mortgage brokerage services. She also emphasized that despite being part of a large national institution there was a high degree of autonomy in local decision making for US Bank branches, adding: “Within the greater organization we have regional groups with independent latitude. “We have a community banking type model under a regional president and, in fact, it is the best of both worlds to work for a large professional national bank with all its backing and resources while also being able to be entrepreneurial in local markets. Sometimes I don’t think we do an effective enough job of communicating that point. “We also actually act as a correspondent lender and are a major supporter of community banks regarding providing services and technology to allow them to function effectively.